With the upcoming Carlton Landing holiday home tour, I thought it might be fun to ramp up the decor inspiration a bit as we head towards Christmas. I LOVE Christmas and all the preparation, anticipation, and decoration. There’s something so happy about beautiful trees decked out with ornaments and houses outlined with lights. This year I’m feeling inspired by all of the farmhouse trends swirling around (have you seen the new Chip & Joanna collection at Target?) and I’m also inspired by the Scandinavians and their simplicity in how they decorate for the holidays. Both trends share the same focus on natural elements and loads of textures and there is so much visual inspiration to pull from. Can we talk about how beautiful it is to stick with a nice, monochromatic color scheme? There’s something so soothing about this entire vignette. And of course, a buffalo check stocking never hurt. A beautiful Christmas tree with pops of red and silvery green. Love those marquee letters that spell Santa. How darling are these little potted trees? This would be a great budget-friendly project. Satiny ribbons with pinecones and evergreen boughs – an unlikely combination but the contrast is what makes this work. A perfectly undecorated Christmas tree pair, complete with a ceramic pot in lieu of a stand. And those gingerbread boxes are beyond darling. Simplicity wins again. Red, grey and white always work well together. But another vote here for monochromatic. Can you tell that buffalo check is a must? Of course, a beautiful array of plaids doesn’t hurt either. Love them with those simple wreaths and pops of red. I’m dying to recreate this on our front porch. A wee tiny Christmas tree with a big red bow, surrounded by kraft-wrapped presents and presented on a Radio Flyer wagon. So happy and festive. The color lover in me is delighted by this retro-inspired front porch. Aqua and red are such a fun pairing that just works, no matter how you slice it. Those painted pine cones provide a ton of texture and unexpected whimsy. Natural wood elements reign supreme in this little corner. And simple star garlands and evergreen boughs turn a corner of the kitchen into something magical. Another vintage sled and potted tree with simplistic undertones. 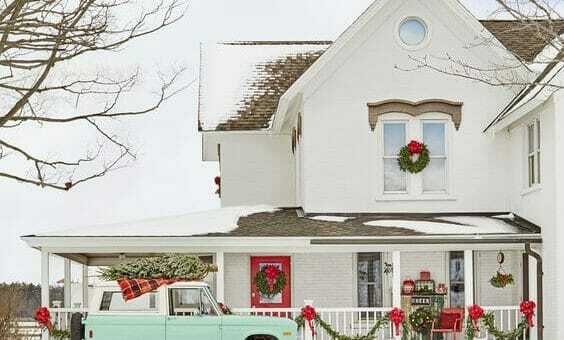 And loads of wreaths and garlands cut directly from the homeowner’s yard in this fanciful holiday home tour at Southern Living. A happy wee tree in a beautiful woven basket. Love the texture of the jingle bells hanging from the door. My friend at French Country Cottage has the most beautiful inspiration photos. This trio of simple Christmas trees feels so welcoming and I love the different containers she used. Bells hang from this olive branch wreath, and it’s all held together with a long draping white ribbon. Don’t forget – mark your calendars for the weekend of December 9th: the Jingle Bell Run is happening along with holiday pop up shops and the fan favorite holiday home tours. See all the event details here.